Stems: Erect, simple or much-branched above, densely appressed-hairy. Leaves: Alternate, simple, sessile or short-stalked below, lanceolate, 3-6 inches long, .5-1.5 inches wide, grayish, appressed-hairy; margins wavy-toothed to nearly entire. Inflorescences: Spikes, simple or branched, terminal. Flowers: 1 to 1.5 inches wide, floral tubes .75 to 1.5 inches long; sepals 4, .5 to .75 inch long, bending abruptly backward, nearly glabrous or hairy; tips pointed; petals 4, obovate, 1/3 to 2/3 inch long, yellow, fading orange; tips slightly notched; stamens 8, nearly as long as petals; stigma with 4 linear lobes. Fruits: Capsules, cylindric, .75 to 1.5 inches long, hairy; seeds small, egg-shaped, dark brown to black, often purple-spotted. 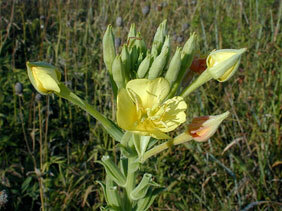 Habitat: Prairie hillsides, waste areas, roadsides, open woods, and stream and lake edges, in dry or damp soils. Origin: Common evening primrose was introduced to Europe in the early 17th century, where its taproot was used as a parsnip-like vegetable. Uses: The Navajo mixed the dried leaves with tobacco and smoked it to bring good luck hunting. Comments: Flowers open in the evening and usually wither the following day.